In January 2011, the 2nd Regiment voted to adopt new uniform and equipment standards for our soldiery. 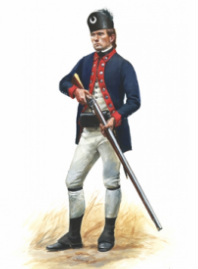 Based on years of painstaking research, the new standards will allow us to portray the men of the 2nd Regiment with as much authenticity as is possible today. The target date for our base impression is the summer of 1779, though modifications will be made for other time periods as events warrant. Most of our clothing and equipment is custom-designed or made for our unit by expert tailors and craftsmen: Stuart Lilie, Jay Howlett, Carl Johnson, Joel Anderson, Roy Najecki, and more. Other items have been very selectively culled from the best vendors available, or are made in-house by our members. We are striving to use the most authentic materials and construction techniques possible for each item in our kit. We have assembled a detailed official Vendor List, which is updated regularly. The list will be available to recruits upon completion of their first event. The following is a brief introduction to our uniforms and gear. If you are interested in joining the Regiment, PLEASE do not purchase ANYTHING without consulting with a member and the vendor list first. 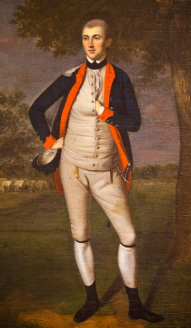 Lt. John Harleston, 2nd SC Regiment, circa 1776, by Charles Willson Peale (courtesy Chicago Museum of Art).